Most of BC’s politicians have been hiding from the press. They give sound bites, and they hold press conferences, but they rarely engage with the public and let you pick their brain. Not Vancouver-Point Grey MLA David Eby though. While most of BC’s government has decided to disengage with the public, Eby is running head first into it. He engages constituents on Twitter, answers emails, and most interestingly – he packs people into town halls to talk about Vancouver’s housing issues. I know what you’re thinking (especially if this is Mike De Jong reading this), “a politician that talks housing? Surely that’s political suicide!” Strangely enough, people who speak to Eby about housing issues like him – a lot. A politician that has good ideas about housing, who’s also likable? Obviously we had to find this unicorn and pick his brain, here’s what he had to say. Vancouver real estate is soaring out of control, and locals are feeling the squeeze. 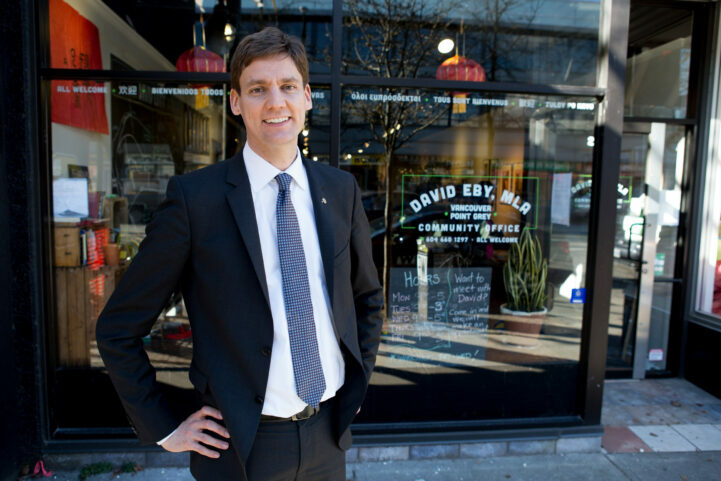 Many people are blaming foreign buyers, but Eby thinks it’s a little more complicated. He didn’t elaborate, but bank lending appears to be a reference to our low-interest rates. The historically low rates allow homeowners to borrow much more than previous generations. This by itself isn’t the issue (although it is an issue). The issue occurs when people borrow more to keep up with non-local salaries. Limited land and international money has placed a premium on the land in the Greater Vancouver Area (GVA). The GVA has attracted some of China’s most affluent families, and they’re not big fans of renting. This has led locals to borrow to compete with these affluent families. It’s kind of a fool’s game, because almost a third of Vancouver is now vulnerable to bankruptcy on a simple interest rate change. Unfortunately, there’s not a lot of other options – especially since rental vacancy rates are some of the lowest in the country. The size of mortgage a household making $100k in income per year, shown along a scaled index of home prices across Canada. It’s not a secret that Vancouver’s real estate is a less than savory issue. It’s quickly become the tool of choice for fraud, money laundering, and tax evasion schemes, and Eby agrees. “We’ve got people declaring poverty incomes buying million dollar homes. We’ve got students buying mansions for $31m. We’ve got realtors involved in money laundering. We’ve got complex tax evasion schemes. We’ve got it all, it’s a Wild West and it needs to be cleaned up. But with that said, we’ve also got serious domestic issues.” explained Eby. Many people in BC say density is the problem, and it’s a simple supply and demand issue. Vancouver Liberal MLA Sam Sullivan told us just a few weeks ago, that he believes building more units may ease the issues. That’s not quite how Eby sees it. “The problem is, you can’t fix the land use problem without community consent, and it’s really hard to get community consent for increased density if they’ve been told for years that density will fix affordability, and only the opposite has happened.” said Eby. We’re building a different kind of news outlet – one that aims to stimulate discussion rather than direct it, but we need your help. Like this article? Share it with a friend. Hate it? Go read the CBC. Kidding! Give us a tweet and tell us why. Just hurry up and let this guy be Premier. These crooks have to go! The crooks will get reelected again. People are morons here.